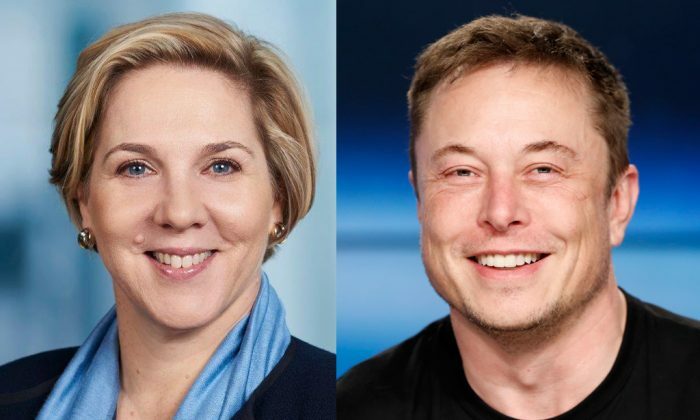 Tesla Inc. director Robyn Denholm, a telecoms executive who has worked for Toyota, has been promoted to chairwoman of the electric car company, tasked with regulating billionaire Elon Musk’s regime after months of turbulence which have worried Wall Street. An Australian accountant, Denholm currently works for telecoms firm Telstra and replaces Musk after he was forced to relinquish the role as part of a deal to head off charges of fraud by the Securities and Exchange Commission. The change in structure at the Silicon Valley firm, agreed to by Musk in a September court settlement, is supported by many on Wall Street who worry that his record of erratic behavior is undermining the company’s progress. While she will resign from Telstra to take the role full-time, some analysts expressed concern that she may not be clearly enough removed from Musk to rein in the billionaire’s public outbursts and bring more order to Tesla. Denholm has been an independent director of Tesla since 2014 and the head of its audit committee. She was paid almost $5 million, mainly in stock options, by the company last year, making her the highest remunerated of its board members. Musk, who remains Tesla’s biggest shareholder and the driving force behind its ambitious plans to reshape electric battery technology and car transport, tweeted his approval of the appointment. Tesla’s court-approved settlement agreement with the SEC requires the company to appoint an “independent” chairman, although it does not define what it considers to be independent. A key question for the SEC will be whether Denholm can be considered to be independent, given her extensive links to the company. The SEC declined to comment on whether it had approved the appointment of Denholm. “Musk, I believe has a ton to do with the selection and he wants to be sure that they can see eye-to-eye,” said another analyst, Elazar Capital’s Chaim Siegel. Denholm is currently chief financial officer at Australian telecoms operator Telstra Corp. Ltd. She pumped petrol at her parents’ filling station before going on to study at Sydney University and joining accountancy firm Arthur Andersen. Since then, she has worked at Swiss power grid maker ABB Ltd., network gear firm Juniper Networks and 1980s and 90s computing giant Sun Microsystems. Telstra CEO, Andy Penn, said when he appointed her: “Robyn has a proven track record as a global COO in a business focused on telecommunications networks. While Tesla is finally starting to make good on Musk’s promises on production of the Model 3 sedan, seen as crucial to the company’s future, it has lost senior executives for sales, human resources, manufacturing, and finance in recent months. CFRA Research analyst Garrett Nelson said it made sense that Tesla should seek to avoid the risk of a genuine outsider clashing with Musk. “We view the fact that Denholm has prior industry experience with Toyota positively,” he said. The company has seen months of turbulence related to the public behavior of Musk, whose gift for self-promotion has made Tesla one of the world’s most talked-about businesses while causing spats with journalists, analysts, Wall Street investors, and rapper Azealia Banks. She takes over as Tesla’s chair immediately and will leave her role as CFO and head of strategy at Telstra once her six-month notice period with the company is complete, Tesla said. She was named as Telstra’s CFO in July.